60 years ago Uncle Milton introduced Ant Farms to the world. Mesmerized by the movements and work ethic of the ants, adults and children would spend countless hours watching as the ants worked together to build a new habitat that could sustain their life. The Ant Farm brought a whole new world to those who watched it, capturing never before seen details and giving up close and personal learning experiences to all. 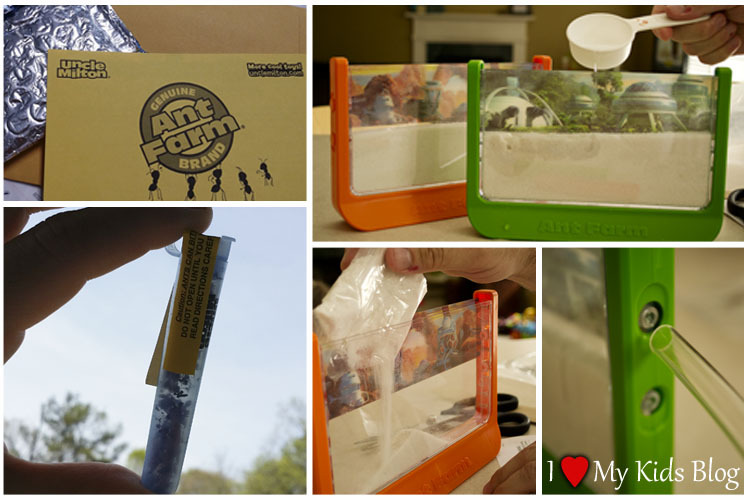 From classrooms to homes, Ant Farms became a must have item for many. 60 years later, they are still a marvel to be seen, captivating audiences young and old. 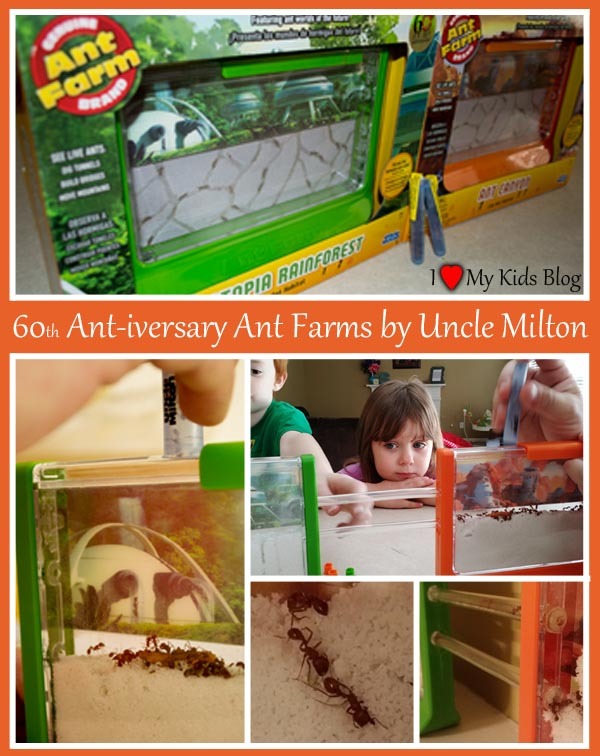 Uncle Milton provided me with two of its newest Ant Farms from their 60th Ant-iversary collection so I could form an opinion and share it with you. Regardless of this arrangement, I was not required to give a positive review. All opinions expressed are my own honest thoughts. At first I was excited, but then had visions of ants getting out and crawling around my house, causing that excitement to turn into a mild anxiety attack. Never having had an Ant Farm as a child, nor seeing one for that matter I was not sure what I had just gotten myself into. I tried not to focus on the fears my mind was creating, but rather turned it to the thoughts my children would have watching in awe as the ants created tunnels and establish a new life, right before their eyes. Setting up the Ant Farms was a great family activity that all my children were able to participate in….once the ants arrived. Getting an Ant Farm is a lot of fun, but don’t plan to set the Ant Farm up the same day you go buy it, because you will have some very sad and disappointed children. You see, Uncle Milton Ant Farms recommend a specific size and type of ant for their habitats and ordering them can take anywhere from 2-5 weeks for delivery depending on the time of year and weather conditions at the time. The Ant Farms come with a code for ordering your ants for free, however you still have to pay for shipping and handling, which was $5. I did not know that there was additional costs or a waiting period to receive the ants. It shouldn’t be any trouble if you plan it out accordingly. Of course, if you do find yourself in that situation, you are able to go out searching for your own ants to put in the farm until the other ones arrive, you just need to make sure they are large ants, otherwise they will climb through the air holes and really make things interesting. When our ants arrived, they came with instructions on how to properly be placed into the Ant Farms. I recommend you read and follow those directions closely. Ants are quick and these particular ones that Uncle Milton uses, bearded ants, bite too! (My husband may or may not have had to chase an ant or two down that escaped during the homing phase.) My husband was filled with childhood memories when the ants arrived because they came the same way they did when he was a kid and had an Uncle Milton Ant Farm of his own. It was fun to hear of his experiences as he shared them with our children. 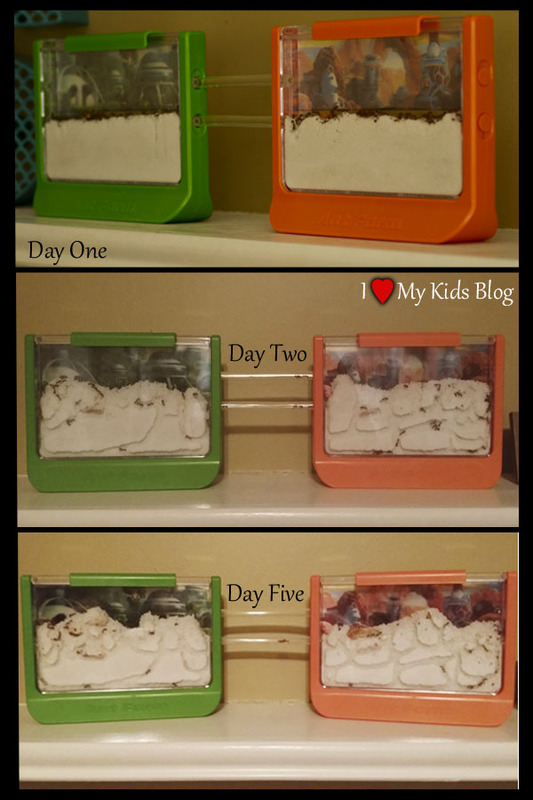 I hope that this experience with the Ant Farms will give my children lasting memories as well. We followed the directions on prepping the sand for the Ant Farms and got everything set up in anticipation for the ants to start their new lives in this awesome habitat. A fun feature of the Uncle Milton Ant Farms is they can connect with each other by attaching tubing provided. This enables the Ant Farm habitats to become interconnected and the ants to blend together, coming and going as they pleased. We got the ants in their new homes and watched them for hours. It was hard to even take our eyes off of them for any prolonged period of time because they started working and building their habitats instantaneously. It was mesmerizing. We would talk about each ant’s job as we saw them moving dirt, deceased ants, and other debris to and fro, hypothesizing each task and how the ants communicated one with another. It was an educational experience that was exactly what I had hoped for. Within hours the ants appeared to have their roles and purposes identified. The next morning we were excited to see what the ants had been doing all night. It has been a week since we set up their habitats. There have been many ant casualties (which is to be expected), but it is still mesmerizing to watch and ponder the activity and thoughts the ants are experiencing at the moment we stop to look at them. We have been giving them water and food as directed, and every day their habitats change. Ants are fascinating insects and having the 60th Ant-iversary Ant Farm collection has been exciting and educational. One thing I wish I would have done to make it an even more educational and interactive experience for my children would be to sit down and journal the daily changes seen in the habitats over a weeks’ time, starting from the first day when the ants were introduced to the habitat. One could have the children draw the habitats and write down their observations daily, then talk about it. Overall, the 60th Ant-iversary Collection by Uncle Milton is exciting and educational. It is an experience every child should have. In the home or in the classroom, this would make a great addition to any adventurous child’s experiences. 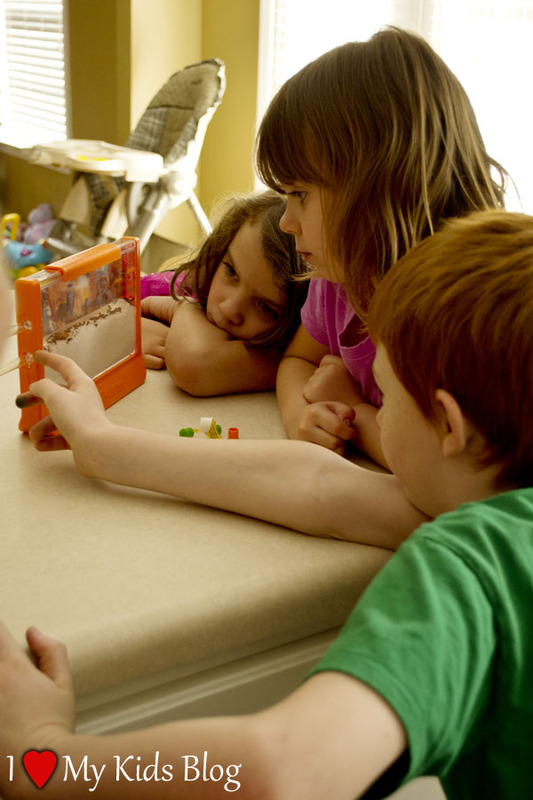 Did you ever have an ant farm or do you have one now? What is your favorite memory with them?